Battlefleet Gothic is Games Workshop's game of fleet actions between mile-long warships in space, set in the same universe as Warhammer 40k. 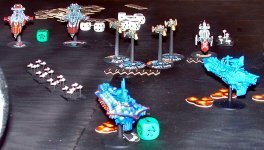 Battlefleet Gothic has an expanding line of plastic and metal miniatures. The plastic ships have excellent detail, making them easy and quick to paint. Assembly is also simple and intuitive, with plenty of spare components to allow for immediate conversions right out of the box. An added plus is that the two main fleets, Imperial and Chaos, can interchange components to allow for an even larger range of possible conversions. The line of metal ships is growing, adding more choices both for existing fleets and for new ones. In addition to the counter set provided in the boxed game, there are now metal models for fighters and torpedos. The rule book also gives plenty of ideas for building planets and other celestial phenomena to place on the table top. Since it shares the same universe as Warhammer 40k, Battlefleet Gothic also shares in the incredible depth of background story. Colour text in the rule books for both games now mentions actions in each other with 40k talking about fleet actions and BFG bringing up battles from, for instance, Games Workshop's 2000 Battle for Armageddon grand campaign. This makes the intriguing idea of combining the two games even more inviting, and Games Workshop has printed a guide on how to integrate the two together complete with scenarios and colour photographs. Gameplay is simple yet gives an excellent feel of detail. Large actions can be played quite quickly, and the need for book-keeping is minimal due to their use of colourful and scenic on-table counters and "Special Orders" dice. Momentum is handled by the simple expedient of giving each ship a minimum movement each turn as well as limiting the sharpness of turns according to ship type. 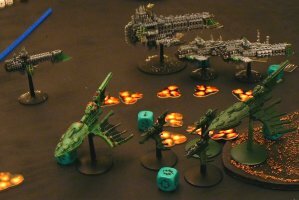 As well, it shares the same type of points and fleet composition system that makes Warhammer 40k tournament play so easy. Though we only started playing Battlefleet Gothic with its recent re-release, it is rapidly becoming one of the NWLGG's favorite games. Created by Steven Patterson, last updated January 19, 2003. "Battlefleet Gothic", the Battlefleet Gothic wordmark, and "Warhammer 40k" are all ® Games Workshop, with all rights reserved by them. Use of these marks on this page is solely for reference purposes and does not constitute an endorsement by Games Workshop, nor should this page content be considered "official" or "approved" in any way by them. Contact us by email: nwlgg@sympatico.ca.